Nominated for the prestigious Royal Philharmonic Society Chamber Music Award, the Royal String Quartet is one of the most dynamic string quartets in the world today, and in 2018 celebrates its twentieth anniversary. Its repertoire combines outstanding musical works of the past with contemporary music, bravely pushing the boundaries of musical genres. 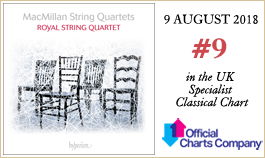 The Royal String Quartet receives enthusiastic reviews for its interpretations of Beethoven, Szymanowski, Shostakovich and Górecki, and also plays an important part in promoting lesser-known Polish music, including the works of Szymański, Mykietyn and Bacewicz. The Royal String Quartet collaborates with exceptional artists—including Angela Hewitt, Sir Thomas Allen, Mark Padmore, Ingolf Wunder, Stephen Kovacevich, Martin Fröst, Andrzej Bauer, Wojciech Świtała, the ensemble Kwadrofonik, and the Škampa, Camerata and Silesian String Quartets—and is not afraid to cross into the realm of pop culture. The Royal String Quartet was established at The Fryderyk Chopin University of Music in Warsaw in 1998 and initially worked under the supervision of Professor Ryszard Duź from the Wilanów String Quartet. The group’s artistic identity was shaped by postgraduate masterclasses with the Alban Berg Quartet in Cologne (2001-2004). Crucial artistic guidance was also provided by members of the Camerata, Amadeus and Chilingirian Quartets. The critical breakthrough in the Royal String Quartet’s career came with the invitation to join BBC Radio 3’s prestigious New Generation Artists scheme. This involved performing in festivals, recordings and radio broadcasts, and collaborating with other participants of the scheme. The Quartet also received a Borletti-Buitoni Trust Award, given to outstanding musicians to help them develop their international careers. The Quartet has performed at Wigmore Hall and Cadogan Hall in London, the Concertgebouw in Amsterdam, Bridgewater Hall in Manchester, The National Gallery of Art in Washington, the Grand Théâtre in Bordeaux, Martinů Hall in Prague, the Palais des Beaux-Arts in Brussels, Konzerthäuser in Vienna and Berlin, Sejong Center in Seoul, Beijing Concert Hall, Konserthus in Stockholm, and also at the Witold Lutosławski Concert Studio of Polish Radio and the Warsaw Philharmonic Hall. The Royal String Quartet has featured in prestigious festivals including the BBC Proms, City of London Festival, Aldeburgh Festival, West Cork Chamber Music Festival in Ireland, Schleswig Holstein and Rheingau Festivals in Germany, Ludwig van Beethoven Easter Festival in Warsaw, Sacrum Profanum in Kraków, Wratislavia Cantans in Wrocław and the Perth International Arts Festival in Australia. Since 2004 they have run their own chamber music festival in Warsaw, Kwartesencja, where the string quartet medium is presented in multiple forms, and contemporary music plays a significant role. From 2012 to 2015 the Royal String Quartet was Quartet in Residence at Queen’s University Belfast. Their concerts have been broadcast on Polish Radio 2, BBC Radio 3 and many other European radio stations, as well as on French Mezzo TV.